So ~ a quick, simple entry calls for a quick, simple post. I got my own URL for my blog! so I am now The Fanciful Magpie. attached itself permanently to my html. I have to cover it with white so it looks like I have NO background. Still have the little logo in the corner, though. that *^&%#*@ CBOTB background hiding in the widget!! So now I have a new button, and a blank slate for my background! You probably have no idea why I am so happy. absolutely LOVE your new blog makeover Maggie, and I personally think that your new name is even classier than your firs. The fanciful Magpie sounds like a wonderful mash up of a fun loving bird and art that's highbrow and fancy. Love it. Primavera is a great addition to the many, many submissions I've had this week, wow. Thanks for entering, I guess I better get mine finished!! Back to the painting desk. Hehehe. I think the Fanciful Magpie is a wonderful name! Your Primavera "doodle" is great. I love the falling trail of flowers. Primavera is so pretty! She is a lovely addition to the contest. And I like your new name of "fanciful"...cute. She is beautiful, Maggie! I also love your new blog header and button. I wish I could figure out how to remove my background and header too. I played with it last weekend and it got all screwy so I just clicked a button to retrieve the unharmed version. lol Anyway I am proud of you for figuring out as much as you have. Have to hunt for a tutorial and let you know if I find a good one. Don't you just hate it when people add code they have no business adding? Delete really IS a great action! Primavera is a lovely "doodle." Of course, I wouldn't call it a doodle, especially since she looks more like a work of art and less like a doodle to me! Beautiful entry. She is so spritely and magical- a glorious spring piece! 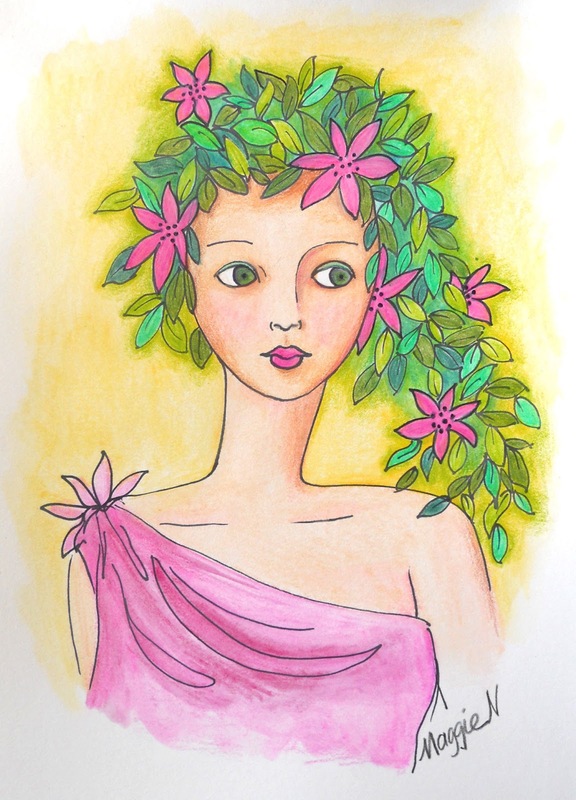 Such a fresh and pretty Spring goddess, love the pink flowers in her hair! Your new graphics are gorgeous too, and the perfect personification of "The Fanciful Magpie!" First of all, I love your Pink Spring Goddess! I Know that sounds repetitive from above posts but it's true, she looks sweet and Springy. Never disappointed when I come to your blog! Which is the second thing.....I LOVE IT! Your new banner is PERFECT and the name is as well. A great duet!! I LOVE your new title- how perfect for you! And Primavera is wonderful- I love that little hint of "tude" you've given her- awesome!